It’s no secret that commercial kitchens can be pretty dangerous. There are so many people working at once, plus there are sharp knives and hot oil to contend with. If you’re not careful, serious accidents can happen. But there are effective ways of preventing accidents and making sure no one gets hurt in your commercial kitchen. One of the most essential steps you must take to make sure your commercial kitchen is safe and protected from the risk of flash fires to sign up for kitchen exhaust system cleaning services on a regular basis. 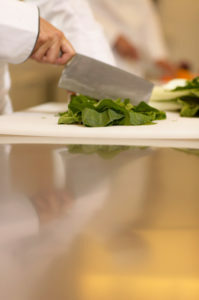 We provide both hand scraping and steam cleaning services for commercial kitchens throughout Southern California. Hand scraping is an effective, affordable way of removing grease deposits in your exhaust system, whereas steam cleaning is a bit more of an investment, but it provides a thorough cleaning. We recommend businesses sign up for hand scraping on a monthly basis and steam cleaning on a quarterly basis. We’ll be happy to discuss your kitchen’s needs and your preferences to set up an ideal cleaning schedule to protect your kitchen well. Call us at 800-700-FLUE or email contact@fluesteam.com to setup cleaning services for your kitchen exhaust system with Flue Steam. Having to change the grease filter in your commercial kitchen is cumbersome, time-consuming, and it can be very messy. Skip the hassle by signing up for grease filter exchange services from Flue Steam. A quality technician will deliver fresh, clean filters right to your business at preset intervals of your choice. The technician will install these new filters for you and haul away the old ones for cleaning. This will reduce your risk of fire and free up your staff for other, more interesting tasks. We recommend that most restaurants have their grease filters replaced every 2 weeks. Simply call us at 800-700-FLUE or email us at contact@fluesteam.com to initiate services today. Since the safety and efficiency of your kitchen is important to us here at Flue Steam, our technician will inspect your exhaust fan every time he or she comes to clean your exhaust system. If your belts are worn out and you have a replacement on hand, our technician will gladly install the new belt for you at no additional charge. Because preventing fires in commercial kitchens is our mission, we also provide automatic fire suppression system services and portable fire extinguisher sales and services throughout Southern California. We hope you’ll never need them, but just in case, it’s essential that you call Flue Steam or email contact@fluesteam.com to make sure they’re in solid working condition. Contact us today and enjoy a safer commercial kitchen tomorrow.